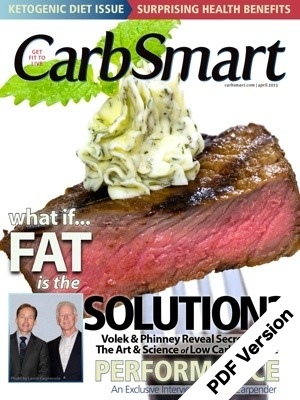 CarbSmart Magazine #02: The Surprising Health Benefits of Ketogenic Diets. Want to lose weight? Improve your health? Rocking the low carb lifestyle? Or just learning about it? CarbSmart Magazine is for you. No matter what version of carbohydrate restriction you choose, we're here to guide you, so you can make the best decisions for you. CarbSmart Magazine is a monthly publication that supports the low carb community and helps educate both newbies and experienced low carbers. Despite the many diets and exercise programs now available, obesity is not beating a retreat. Instead, it is on the rise: 36 percent of the U.S. population today is considered obese compared with only 28 percent when CarbSmart.com first started publishing online in 1999. Type 2 diabetes is also increasing at alarming rates. In the U.S,. more than 11 percent of adults, as well as one in every 400 children and more than 25 percent of seniors are diabetic. Another 35 percent of the U.S. population is at risk for diabetes and rates of diabetes and obesity are rising worldwide. CarbSmart Magazine brings news of the low carb, diabetic, and Paleo lifestyles to all who can benefit from them – and we believe that’s just about everyone. Best selling author Dana Carpender, who has written 17 books, including her two latest, 500 Paleo Recipes and The Fat Fast Cookbook, is the managing editor. “CarbSmart Magazine provides up-to-date and unbiased information about the many benefits of the low carb lifestyle,” says Carpender. “Our focus is to cover anything that will help our readers be successful on a low carb diet, so they can reap its many benefits. We also provide information about low carb diets to control or eliminate diabetes. And we evaluate and report on the latest research & information about carbohydrate restriction and diabetic and Paleo diets to help our readers understand how these diets may help them." CarbSmart Magazine also contains product and restaurant reviews, as well as practical tips on everything from family meal planning to eating on the go. The magazine's goal is to help its readers incorporate healthy living into every aspect of their daily lives. Our team includes some of the best-known writers in the low carb community, plus some up-and-comers: Jimmy Moore, James Carlson, DO, Jacqueline Eberstein RN, Amy Dungan, Susie T. Gibbs, Caitlin Weeks, Tara Grant, Jamie Saal Van Eaton, Fred Hahn, and more.